Arlington businessmen Chris Elliott and Jim Dunnagen, doing business as Heart of Texas Racing, completed the purchase of the Bandera Downs in Bandera, Texas on Monday, June 14. 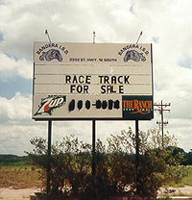 Heart of Texas Racing paid $1.2 million to the Bandera Independent School District for the racetrack property that last hosted live horse racing in 1995 and plan to use it as a training center. Elliott and Dunnagen said that they expect the Bandera training center to create 70 to 100 local jobs. The also said that the 134-acre facility will be used as a special events venue and possibly a rodeo arena. "I hope they can create jobs that employ people that live in Bandera," said County Judge Richard Evans. The $1.2 million sale proceeds will go toward building new school administration offices and an alternative high school to replace those now at the track. School offices have until January to relocate to portable buildings at Alkek Elementary School. By then, progress will be under way on removing brush and debris that have piled up since the last race in 1995, shortly after the site underwent a $6 million face lift. "The track needs a lot of work before you could run horses on it," Elliott said. "There's 300 to 400 stalls out there, and we need to decide what's salvageable. The grandstand's in pretty good shape." Dunnagen also runs the Squaw Creek Downs horse training and boarding facility at the former Trinity Meadows Racetrack in Willow Park.